Is Fresh Cantaloupe Juice Healthy? By Sunny Yingling, M.S., R.D., C.S.S.D. The United States Department of Agriculture promotes the message “Fruits & Veggies - More Matters™.” Juicing carrots is a quick, convenient way of adhering to the USDA’s recommendation. Fresh squeezed carrot juice is a nutrient-dense beverage, high in vitamins and minerals for each calorie it provides. Fresh Squeezed Carrot Juice has 30 Calories and 0.42 g of Protein per 100 gram serving according to the nutrition facts provided by the USDA Food Composition Database. According to the USDA, canned carrot juice provides 94 calories per cup or 12 calories per ounce. This includes approximately 2 grams of protein, a minimal amount of fat -- only 0.35 grams -- and 22 grams of carbohydrate. You can expect a similar nutritional profile between canned -- made from 100 percent whole carrots -- and fresh squeezed carrot juices. Vegetables used for canning are processed within hours of being harvested from farms, which means the nutritional value of the carrots in canned juices is conserved. Carrot juice is significantly high in vitamin A, providing 45,133 international units per cup or 900 percent the daily value. Additionally, a cup of carrot juice contains 20 milligrams of vitamin C -- 33 percent the D.V. -- and 46 percent D.V. for vitamin K and 20 percent D.V. for potassium. Approximately four large carrots makes 1 cup of carrot juice. The World Carrot Museum recommends using whole carrots instead of baby carrots, using a vegetable brush for cleaning carrots before juicing, abstaining from peeling the carrots to preserve nutrient value, and cutting off the ends of each carrot. The nutrients in fruits, vegetables and their juices are lost due to environmental factors such as oxidation, heat and light the longer they sit. 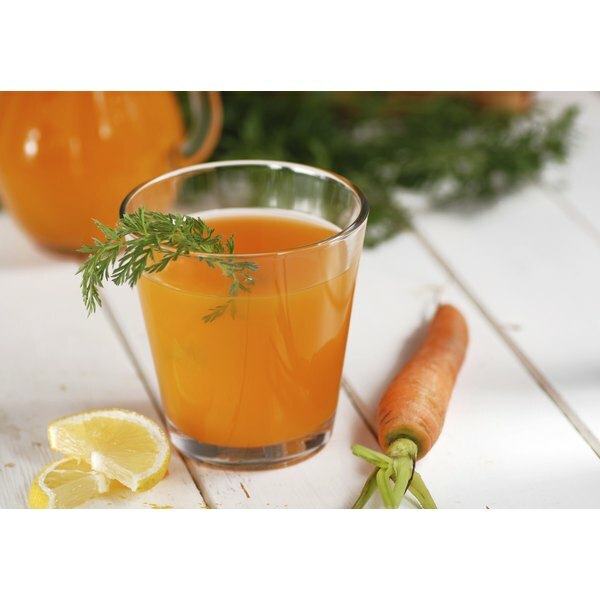 Drinking the carrot juice right after it is processed provides the greatest nutritional benefit. If you don’t plan to drink the juice right away, or are making a large batch, refrigerate immediately and try to drink it within 24 hours or freeze the remaining juice. How Do I Lose Weight With Potato Juice?